My random restaurant adventures led me to Dan Sung Sa a few weeks ago and it turned out to be a pretty good find. 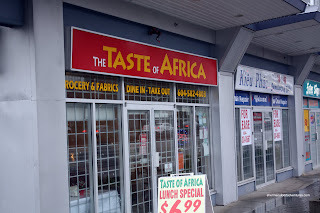 While exiting the parking lot, I noticed another interesting place named the Taste of Africa. Hmmm... African cuisine eh? Interestingly, I'm not even sure what African food is all about since there are like 53 countries within the continent. 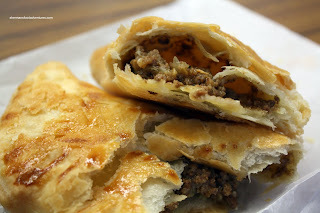 I've been to Simba's and it's mainly Eastern African cuisine, where there are Middle Eastern influences. From what I can gather (and correct me if I'm wrong), I believe the Taste of Africa is Western African food. As per usual, I was the first customer for lunch (I have an early lunch hour). Warmly welcomed by what I figured as the owner of the place. Well, her picture is on the sandwich board outside... She assumed I was there for the lunch special and she was right. At $6.99, it seemed like a good deal to me. 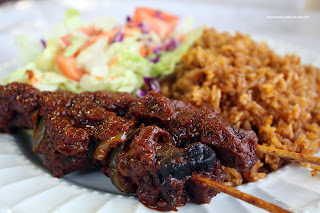 I decided on the Jollof Rice, Beef Kehbab and Salad. The kebabs were cooked quite thoroughly. Something that I normally don't prefer; but it is how they prepare it here. The sauce was only slightly spicy with some tang. Despite the rich colour, the rice was on the dry side and only moderately seasoned. The meat patty that I got to go was extremely flaky, buttery and light. The meat filling was soft and only moderately spicy. I would've preferred a bit more meat; yet at the same time, I can see how that would make it too dense. Compared to a Jamaican patty, this one is bigger while actually being less filling. Definitely not as spicy and a whole lot flakier. In general, none of the items I tried were outstanding. With that being said, it was inexpensive and a departure from the usual. That in itself makes the Taste of Africa unique and a place to try if you're in the area. Taste of Africa is WA cuisine. Simba and Axum Ethiopian are EA cuisine. Safari Gourmet Pie is SA taste. Yah, that's what I figured, thus I let it go. There usually a reason for everything. Although I do like meat!